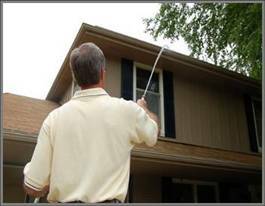 Omaha Door & Window is pleased to offer you the LEAFPROOF Advanced Gutter Protection System.Let Omaha Door & Window eliminate that dirty and dangerous job of constantly cleaning your gutters. 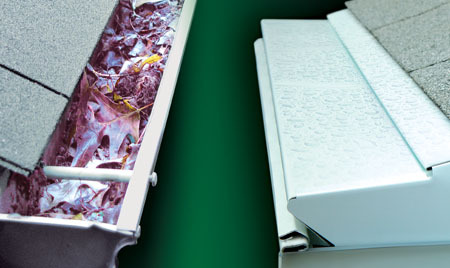 The LEAFPROOF System attaches securely to your existing gutters and acts as permanent protection. Ask us about our special heat tape that can be installed into your system to keep your gutters free of ice and snow build-up during the winter. Selecting the right Gutter Protection IS important! All the beauty and benefits with none of the work – that’s the advantage of our LEAFPROOF Gutter Protection System. 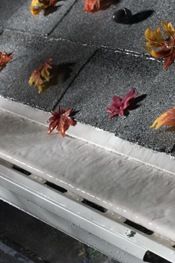 Its innovative design channels storm water through, while keeping out debris – including leaves, sticks, balls, or anything else that can get caught in your gutters. With LEAFPROOF, water doesn’t sit in your gutters, blocked by debris, so your gutters don’t become a breeding ground for mosquitoes. Gutter and eave troughs have an important job. They form your home’s rainwater management system, which channels water away from your home in order to prevent water damage. When leaves and other debris fall into your gutters they can clog your gutters and prevent them from working properly. They can accumulate rotting material, which forms the moist bed for both plant sprouts and mosquito larvae. When your gutters work properly, they help prevent mold growth, deck and foundation damage, landscape destruction, and infestations of termites, mosquitoes and rodents. That’s why it’s so important to make certain your gutters remain clean year-round – which is a messy and sometimes dangerous job. The National Safety Council recommends that homeowners keep rain gutters unclogged to help fight mosquitoes. Source: West Nile Fact Sheet, National Safety Council. Mosquitoes are spreading West Nile Virus throughout the U.S. each year. Today, all but five of the 50 United States have reported cases of illness from West Nile Virus. Source: CDC, 2003 West Nile Virus Activity in the United States (Reported as of April 14, 2004). According to the CDC, Nebraska and Iowa had 48 reported cases of the West Nile Virus in 2010. Accidental falls are the leading cause of nonfatal injuries in the home – over 1/3 occur to adults 45 and older. Source: Injury Facts 2003 Edition, National Safety Council. Leaves and other natural debris stay out of your gutters. Eliminates the hazardous chore of climbing a ladder and cleaning the gutters. Blends with your gutters and roofline. Your gutters won’t become a breeding ground for mosquitoes or an entryway for termites. Plants will no longer sprout up from your gutters. Prevents water damage to your gutters, fascia, siding, and foundation from over-flowing gutters. Balls and frisbees won’t get stuck in your gutters. Installs securely under the first row of shingles. 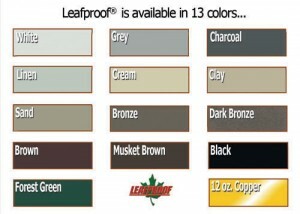 LEAFPROOF Advanced Gutter Protection System is installed under the first row of shingles and acts as permanent protection. Many gutter products require screws to be put into your roof, which can potentially cause damage. This installation method eliminates the need for these screws. It makes use of Hydro Tension to channel rainwater into the gutter, while leaves, sticks, balls and other debris are kept out. 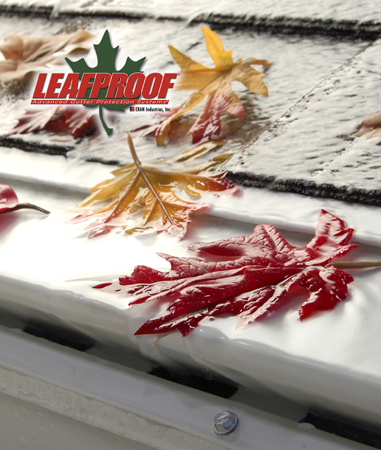 LEAFPROOF allows gutters to do what they’re designed to do: drain water. Even during heavy downpours, the S-Bend design slows the flow of rainwater and easily channels it into the gutter. Hydro Tension is How it Works! Hydro Tension is the principle that allows water to rise above the rim of a glass, or why, when you tip a glass of water slowly, the water does not fall straight down, but follows the contour of the outside of the glass. Hydro Tension causes water to follow the contours of the LEAFPROOF system into your gutter, while debris simply falls to the ground. Slows the flow of rainwater, causing the water to adhere to the Leafproof panel. 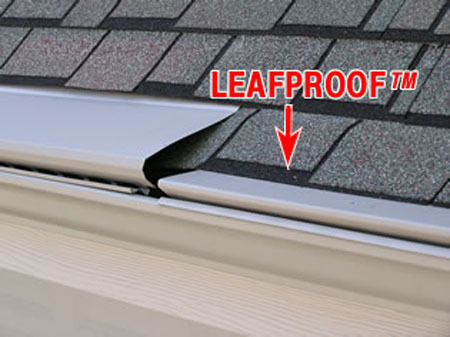 The LEAFPROOF Advanced Gutter Protection System is made from a .024 Aluminum, which will never rust or collapse like screens and products made from vinyl. Select from a palette of 13 decorator colors. We recommend matching or blending with the color of your gutters. Actual colors may vary depending on your computer screen display. 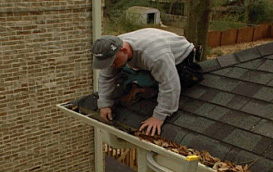 Installation – Leafproof is installed under the first row of shingles and acts as permanent protection. This is important because it slows the flow of water down and allows the surface tension principle to work better. 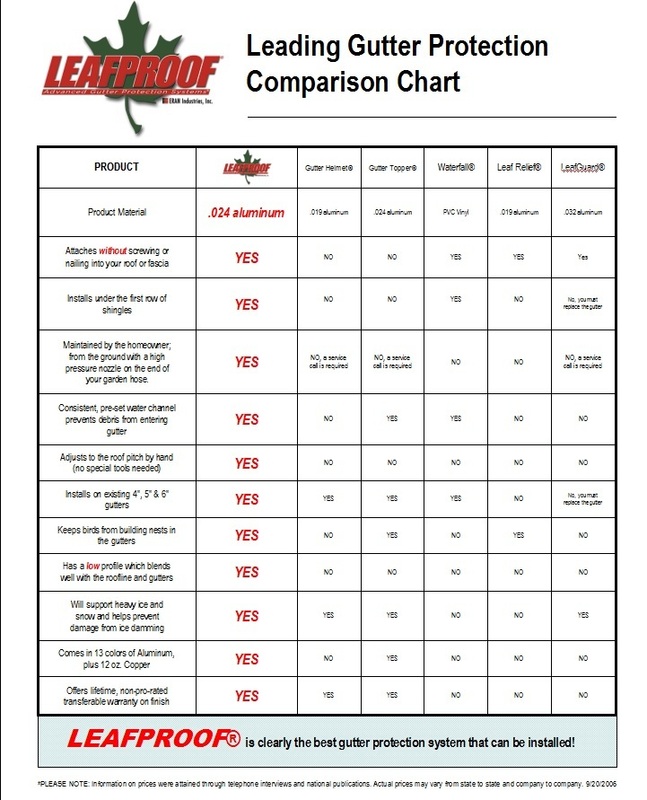 Comparison Chart – We have provided a comparison chart with LEAFPROOF and other Gutter Protection products to demonstrate why LEAFPROOF is the best option for your home. Click here or on the image below to see the full chart. A minimal amount of maintenance is required with the LEAFPROOF system. Annual spray cleaning using a garden hose with a sweep nozzle or pressure hose will help maintain performance excellence. In regions where excessive tree sap, hardwood tree tassels, and/or pine resin are prevalent, this front edge may require additional periodic cleaning.